Russia’s volatile, yet rapidly expanding e-commerce market is raising eyebrows in the global marketplace. With Europe’s largest online audience, Russia still has lots of room to grow. Unlike the highly saturated Internet markets in Germany (83 percent) or the United Kingdom (84 percent), Otkritie Capital Research reports that Russia’s online penetration rate is still around 50 percent with a projected increase of 30 percent by 2015. Combined with rising e-commerce rates and increasing monetization of existing Russian Internet (RUNET) users, these numbers offer significant opportunities for businesses looking to expand their global presence. Moving into the Russian market requires a carefully customized online strategy. Having followed key global trends, such as rising mobile and social engagement, Russia has managed to remain local and establish unique rules for success in online marketing. Consider these three important opportunity drivers when developing a strategy for entering the Russian market. User engagement rates in Russia continue to rise. Given Russia’s history with government control and censorship, many of today’s consumers choose word-of-mouth and peer-to-peer recommendations over information from formal institutions or official news sources. Social media and mostly local social networks have become vital sources of information for brand and product decisions. According to comScore, Russia is in the top three most engaged social networking audiences worldwide with visitors spending an average of 10.4 hours on social networking sites per month. Compared to 6.9 hours per person in the U.S. (which did not rank within the top-10 countries for social networking), Russia’s level of consumer engagement is a marketer’s dream. Leveraging this social powerhouse can result in a long-term relationship with Russian consumers, who typically form a very strong connection to a brand. However, running a successful social branding campaign is as much an opportunity as it is a challenge. In order to become true advocates for a brand, Russians expect a lot in return. New market entrants would need to supply fresh, relevant and quality content to accommodate the growing information appetites of target customers, while beginning to establishing longer-term relationships with future prospects. Consequently, corporate tweets and social networking profiles are now visible via Russia’s preeminent search engine Yandex, which has recently shifted its search ranking priorities to accommodate such new factors as freshness and relevance of content. Localizing international content for Russia is highly encouraged and welcome at almost every level of the user/buyer engagement process. And while understanding the local intricacies requires considerable physical resources, the ROI of establishing early competitive advantage and brand recognition in Russia can be significant. The rule of thumb for localizing in Russia is following the market. Several marketing channels offer specific tools and incentives to help geo-target and localize content. For example, Russia’s largest online portal and search engine Yandex shows different search results for geo-dependent queries in more than 1,250 Russian regions. Yandex places a lot of emphasis on perfecting its local search technology and offers a number of tools supporting geo-targeting and SEO localization. Webmasters can register their sites with tools like Yandex.Catalog, Yandex.Webmaster and Yandex.Spravochnik to assign relevant regions to geo-dependent content. Another noteworthy set of criteria to help localize global content is Yandex’s newly released guidelines for commercial subjects. Businesses are encouraged to provide quality content, in addition to easy and secure access to product pages. Russia is one of the countries that demands translation for most English-language terminology. Content marketers need to remember that most service/product attributes, such as colors, features, descriptors, and calls-to-action, have to be translated to capture traffic and secure conversions. In some cases, Russian translation or transliteration of a brand name shows comparable volumes to usage rates for the originals. The early development stage of Russian e-commerce is evident from the discrepancy of researching online and purchasing offline (the ROPO effect). While offline shopping is still the most common and dominant purchase method across major tech product categories, it’s important to remember that e-shops and online information websites serve as powerful inspiration tools. The high information needs of Russian shoppers leap ahead of the quality content supply for a number of business verticals. 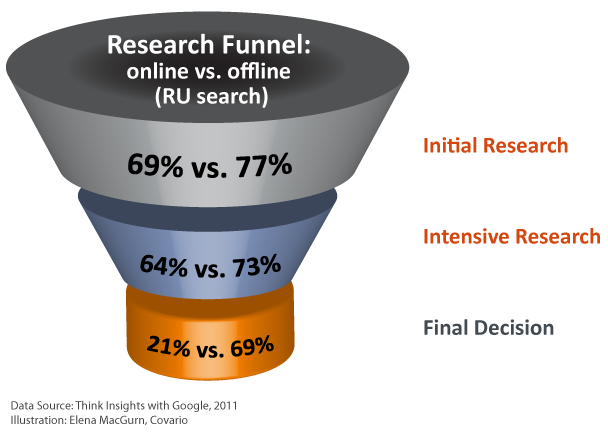 This information void means marketers are presented with a tangible opportunity to influence offline conversion rates in Russia. Creating awareness and helping users navigate to relevant online resources should be the primary focus for initial and intensive research stages of the global brand discovery process. Consider creating a branded program that offers quality content to educate your audience during these crucial stages of user engagement. The increasing significance of RUNET has revealed the vast business potential of the Russian marketplace. Leveraging Russia’s e-commerce opportunities requires early entrants to personalize strategy and invest in building a long-term relationship with the growing number of Russian consumers. Businesses looking to succeed in Europe’s leading Internet market stand to benefit greatly by adopting a holistic approach in marketing and creating content for the Russian Internet user. About the Author: Elena MacGurn is a Senior SEO Specialist at COVARIO, an award-winning search marketing agency.